As eco-friendly as it is versatile, the Copernicus Double-Sided Bamboo Easel is a traditional teaching easel that doubles as a magnetic dry erase board. 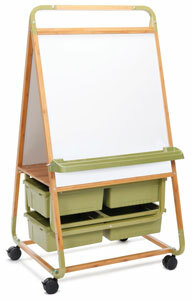 Convenience features include an easel on each side, four sliding storage tubs, and a ledge for holding markers, books, posters, and more. ® Copernicus is a registered trademark.